Happy Thursday! Lately, I have been using lots of sketches to make layouts and I am loving it. Today I'm sharing my take on a Citrus Twist sketch challenge. Below is the actual sketch. 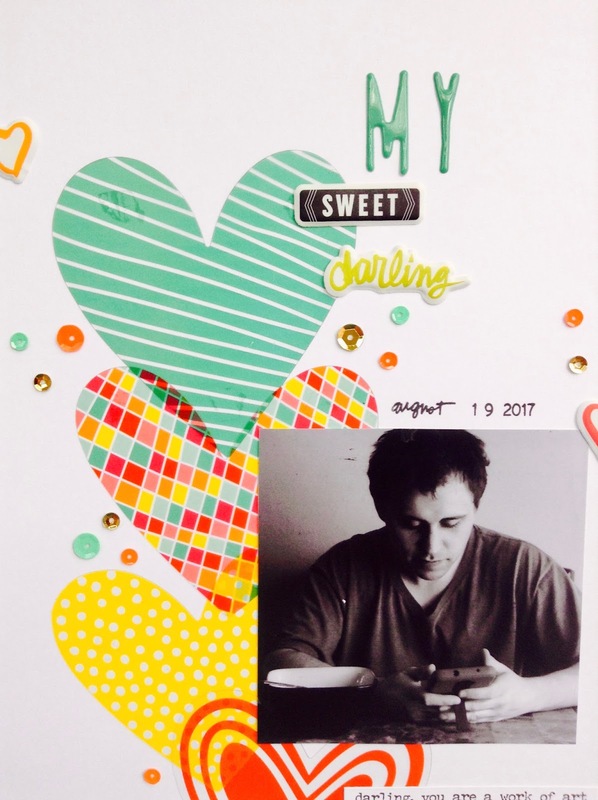 For this layout, I used a photo of my husband. I love when I capture photos of my family while they are not looking at the camera. I really love this photo so I knew that I had to use it on my layout. I decided to keep this layout simple and used a few items in my stash. Since the sketch has several hearts going down the page, I knew that the transparency die cut hearts from the January 2016 Freckled Fawn embellishment kit would be perfect for the layout. To adhere the hearts, I used my Tombow Xtreme Adhesive glue runner. Then I used the same adhesive on my photo and placed it on top of the hearts. Once I had my hearts and the photo adhered, I added the Tim Holtz sticker phrases and the Amy Tangerine puffy heart and word stickers. I also used some alpha stickers to spell out the word "My" since I didn't want my title to simply be "Sweet Darling". Then I added some sequin stickers and then added the date to my layout. Below is another look at my layout. I really loved using this sketch because I was able to use so many items in my stash. I have had a hard time using up a lot of my transparency heart die cuts so it was nice to finally put them to use. 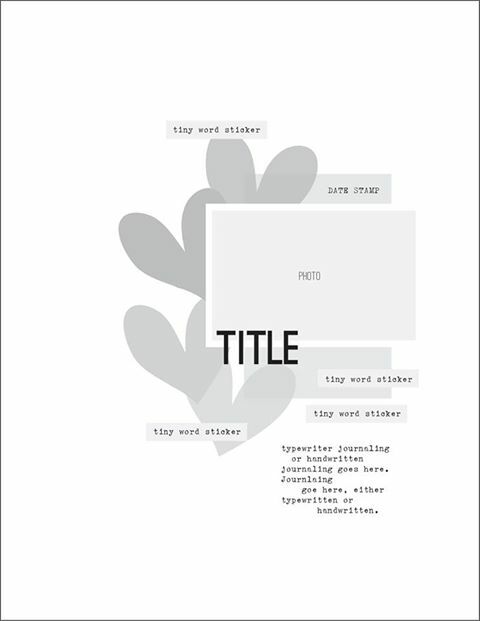 Do you use sketches when creating layouts or other projects? What have you been documenting? Happy Wednesday! Today I'm so excited to share my review of Women in Sports by Rachel Ignotofsky. I first heard of Ignotofsky when her book, Women in Science, was released. I am not really into sports, but I have always been interested to hear about the achievements and stories of women in sports. Unfortunately, it seems that a lot of people focus on men and sports so I think it's important to note that there are women who helped contribute to sports. This book is absolutely amazing! The book features 50 women in different sports. Some of the sports mentioned are soccer, basketball, baseball, figure skating, skydiving, softball, track and field, tennis, ice hockey, and more. There are a lot of doodles and the art is really cute. Each page features information on the athlete in the form of a mini essay. I also love that there are little facts and quotes that the athletes were quoted as saying on each page. The book also has a timeline, a section on muscle anatomy, information on pay and media statistics, and features influential sports teams as well as a section about more women in sports. I loved learning about Madge Syers. She was a figure skater who began the trend of skating in calf-length skirts so that the judges could see her footwork. She was also the first woman to win two medals in figure skating at the same Olympic Games. I also loved learning about Tiny Broadwick, a skydiver. She was called "The First Lady of Parachuting" and was the first woman to parachute into a body of water. The U.S. military asked her to advise the aeronautics corps on parachute use during World War I.
I really enjoyed reading this book and highly recommend this book. I think it's perfect for people who love sports as well as people like me who are not really big sports fans. Have you read Women in Sports? If so, what are your thoughts? Watching: I'm so excited that The Last Ship premiered last night. It's such a good show and I highly recommend it. 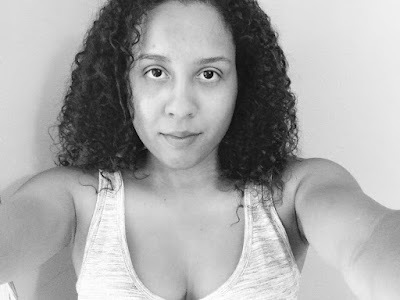 Reading: As usual, I'm catching up on some blog posts. I also plan to finish reading Women in Sports by Rachel Ignotofsky. Listening: I really love this song. You can check it out here. 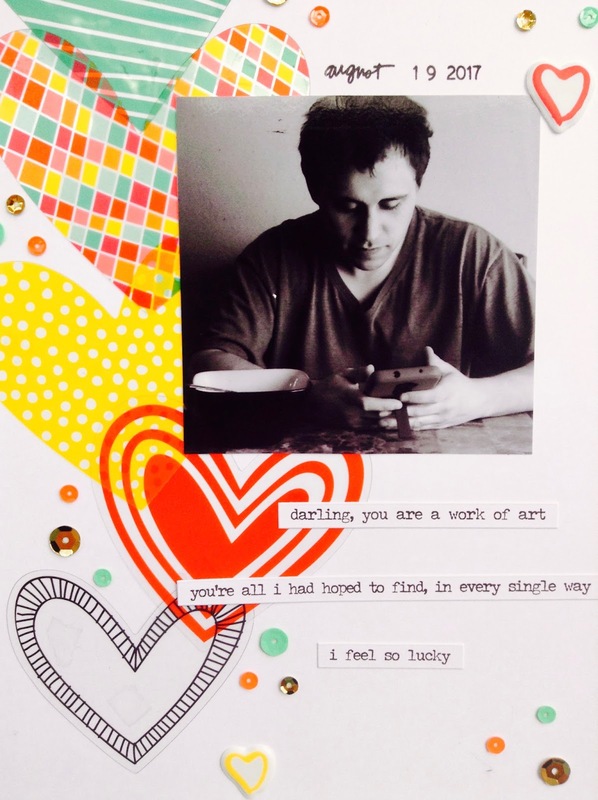 Making: I've been making lots of blog posts, greeting cards, and layouts. I also have to finish working on some projects. 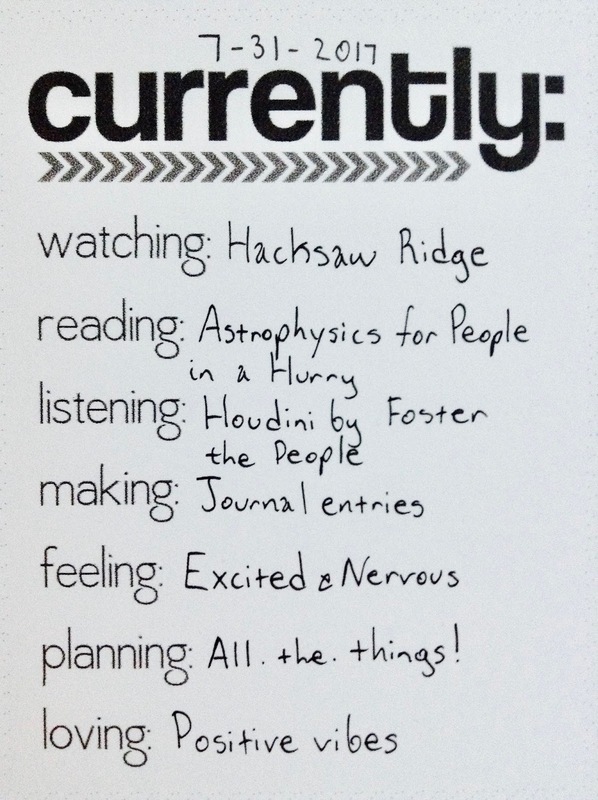 Feeling: I'm so excited to get a lot of stuff done this week. I'm also excited for the solar eclipse. I think it's going to be cool to see that it's dark outside in the afternoon. Planning: I have so much to do this week and I really need to finish planning this week. Loving: The latest episode of Game of Thrones was amazing. I am a bit mad about a specific scene (I won't spoil it lol), but it was still a great episode. Happy Monday! 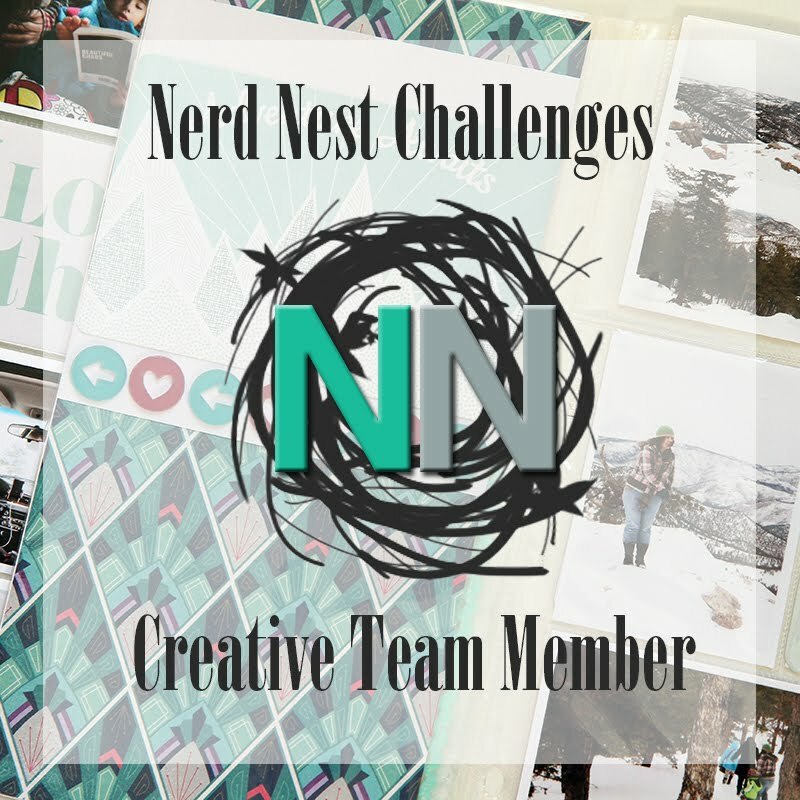 Today I'm over at The Nerd Nest with my take on this month's challenge. This month's challenge is to mimic your photo. You can check out my entire take on the challenger over here. Happy Friday! 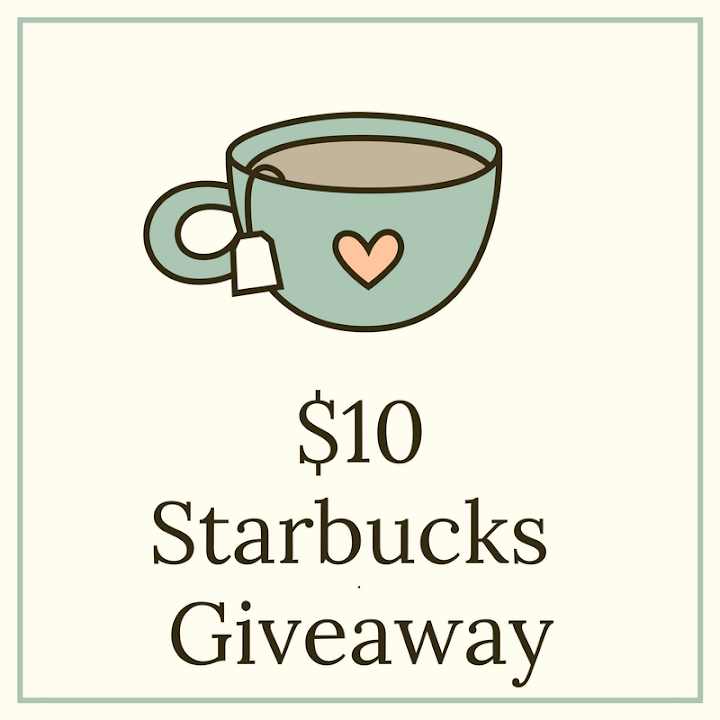 Today I'm linking up with Charlotte, Lindsay, and Beth for their weekly happy/grateful list link up. How many of you have a hard time picking a birthday gift for a family member or friend? I know I do. My husband's birthday is in a month and I have no idea what to get him. So imagine my surprise and excitement when I was contacted by Uncommon Goods to do a gift guide featuring some awesome finds on their website. Uncommon Goods is a Brooklyn based company that offers handmade, recycled, and organic products. They created a fantastic program called Better to Give which lets consumers pick a non-profit organization to receive a $1 donation from them. Uncommon Goods is a B Corporation member which is an organization that helps consumers understand how their purchases can help make social and environmental impacts. When I found out that they wanted to work with me, I was absolutely excited. Usually when I have to shop for a gift, I try to think about what my friend or family member interests are. Eventually, I end up just purchasing a gift card. I usually buy John a gift card to one of his favorite stores, but this year I really want to get him something different. 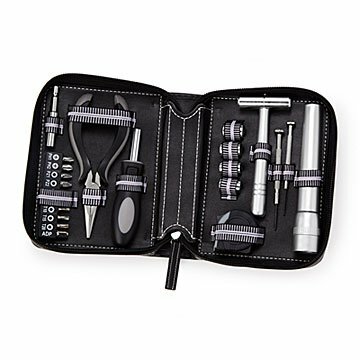 So I decided to check out some unique birthday gift ideas for men on this page. I also found some unique anniversary gifts here. Uncommon Goods even has amazing gifts for men that would be perfect for a "just because" gift. We love coffee mugs and actually have a collection of them. Whenever we go somewhere new, we always make sure to get a mug. 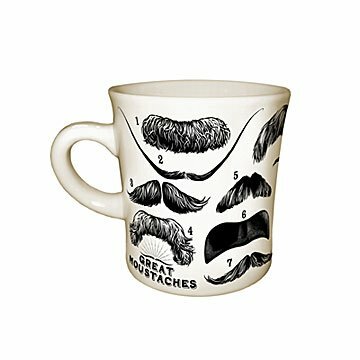 This awesome moustache coffee mug would be a perfect gift. You could even pair this mug with some of your recipient's favorite coffee beans or teas. As I said before, I tend to buy gifts that I know the recipient will love or types of products that fit into the recipient's interest. John is always trying to find something that will be good for shaving and I just love this a DIY kit. 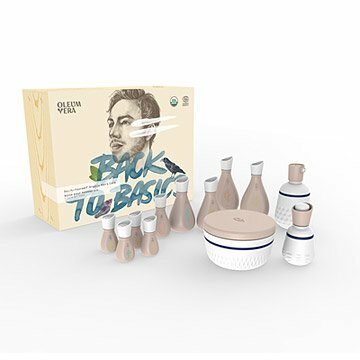 This kit is fantastic and comes a recipe book with instructions on how to make shaving serums, a body scrub, a massage oil, hair rinse, and a hair and scalp serum. I don't think you can ever go wrong with a tool kit. The Fix It Kit is awesome and has a flashlight, pliers, foot tape measure, slot screwdriver, interchangeable handle, four sockets, ten assorted screwdriver bits, and a socket extension. I really think I found my new go to online shop for unique gifts. 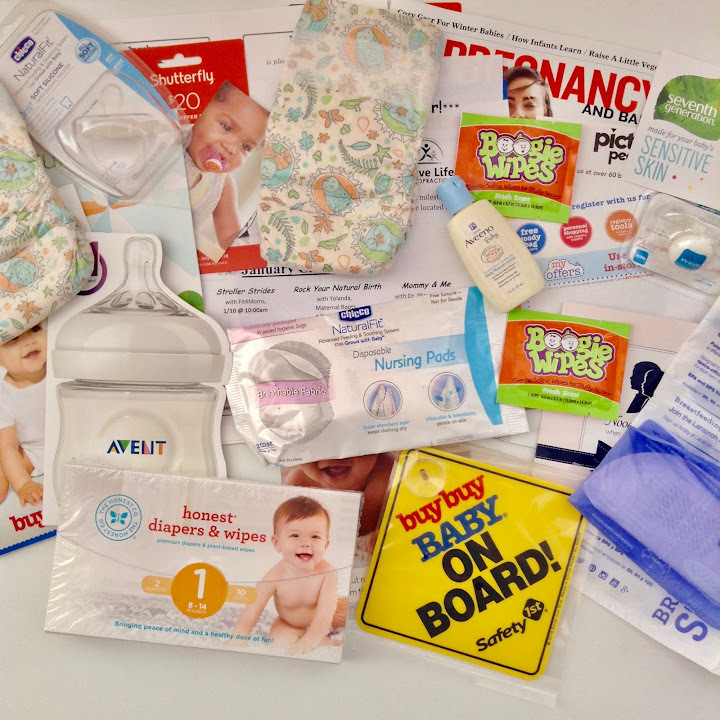 I am so glad that I found out about such an amazing company that has great products, wonderful customer service, and has an inspiring mission. Do you like giving unique gifts? Are you planning to shop for someone soon? Disclaimer: I was compensated for this sponsored post, but all opinions are my own. As always, thank you so much for supporting The Emi Times. Watching: I don't even know where to begin with the stuff that happened in Charlottesville, VA. I think I'm going to take a break from watching the news again. Reading: I just started reading Pillow Thoughts by Courtney Peppernell. It's a poetry book and I will have a review on it soon. Listening: I am loving Utopia by Bang La Decks. You can check out the song here. Making: I've been working on some blog posts and have most of my posts drafted and edited for this month. Feeling: I'm feeling much better. I've been sick for the past few days and have been trying to get some much needed rest. Planning: I have so many projects to work on and I feel like I'm a bit behind because I was sick. So I'm definitely going to get my planner and make some adjustments to my schedule. Loving: I really don't mean to brag and hope that this doesn't come out the wrong way. I have been receiving some good news and I am so excited. I'm loving and feeling thankful for the opportunities that are coming my way. Happy Monday! 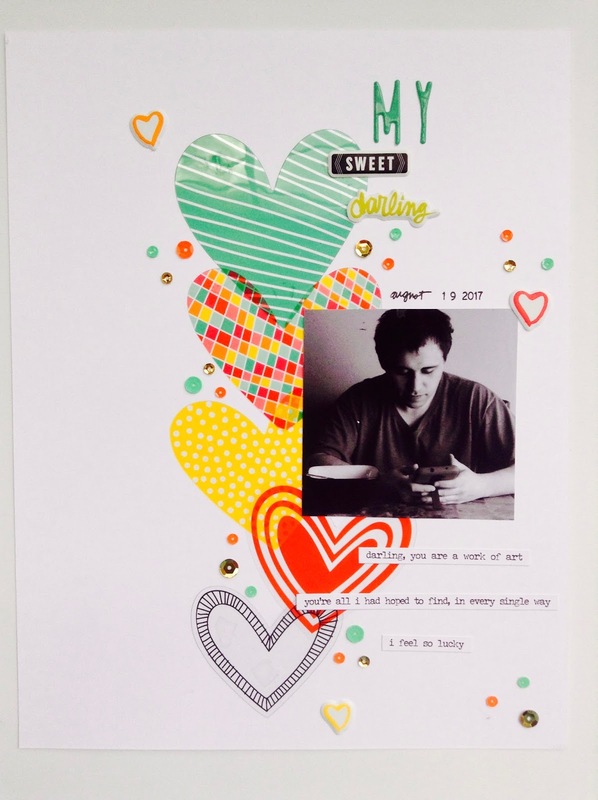 Last I week, I shared a scrapbook layout of my oldest son's first day of school. You can check it out here. 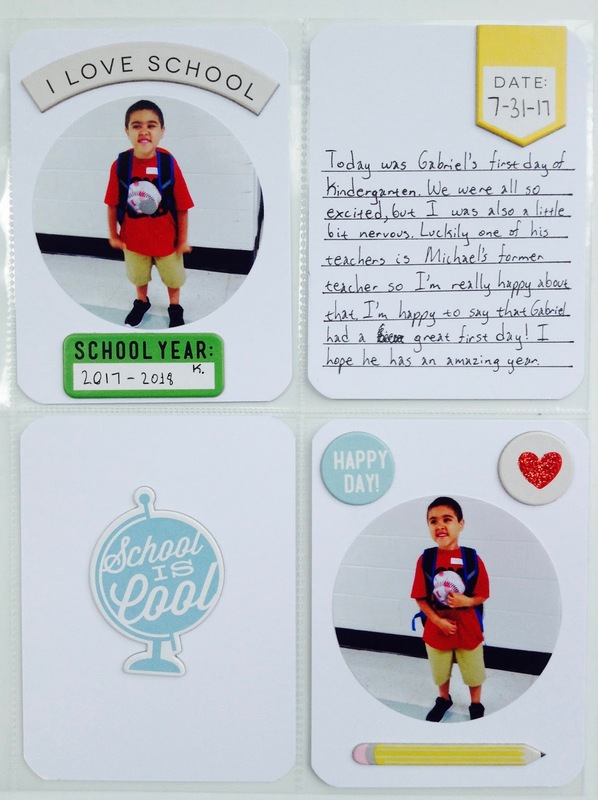 Today I'm going to share a Project Life layout of my youngest son's first day of Kindergarten. To make this layout, I used some blank Project Life cards and one sticker pack. I used a circle punch on my photos and love how they turned out. Once I adhered my photos onto the blank cards, I added some embellishments onto the cards. 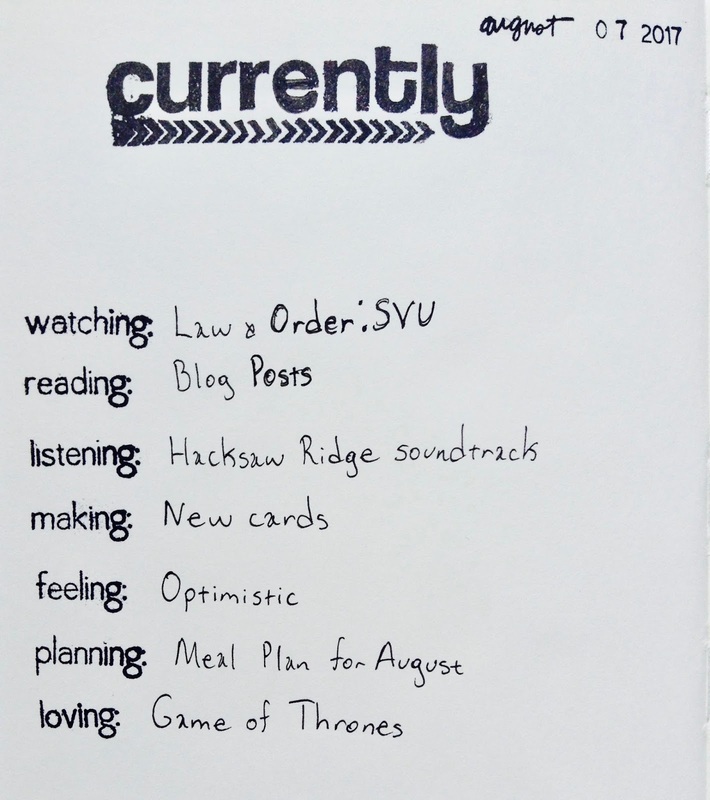 Then I took another card, added some journaling lines and a sticker. I added my journaling on the card and wrote down the date on sticker. I also added a sticker on another blank card. I love that the stickers adds a bit of dimension to my layout. The globe sticker is my favorite sticker. Seriously, it's so cute. I also love the hint of glitter on the chipboard sticker with the heart image. I really love how simple and cute this layout turned out. I can't wait to continue to document my boys' school year. How are you going to document your child(ren)'s first day of school? Back to School season is here! My boys are already in school and a few of the things that were listed on their school supply lists was Crayola crayons and markers. We are a big fan of Crayola and always use Crayola products at home. Whenever it is time to shop for school supplies (and also to replenish our art supplies at home), I always make sure to purchase Crayola products. Crayola's products are decently priced especially during Back to School season. At Walmart, you can find crayons for 50 cents and markers for less than $3.00. Crayola was so kind to send us a bunch of products for review. I am a big fan of Crayola's classic products such as their markers, crayons, and colored pencils. I even use them in my art journals or when I want to try a new art technique. My boys love using all of the classic products in their coloring books and notebooks. We love to make arts and crafts together and always use Crayola. It's definitely an art staple in our home. Crayola has a new collection of art tools called Silly Scents. The collection includes 6, 10, and 12 count sets of Silly Scents washable markers, 12 and 24 count sets of crayons, and a 12 count set of colored pencils. The colors in this collection is amazing, bright and of course is scented. I love the twistable crayons. I don't have to worry about sharpening the crayons or peeling back the wrapper. My boys were so excited to try out the new Silly Scents collection and loved the scents. Nostalgia hit me hard when I tried the Silly Scents markers. I remember using scented markers when I was kid so it's so cool that my boys get to try some scented markers. I highly recommend Crayola for all of your arts and crafts as well as for Back to School shopping. What do you think of Crayola? Are you excited for their new collection? Happy Tuesday! 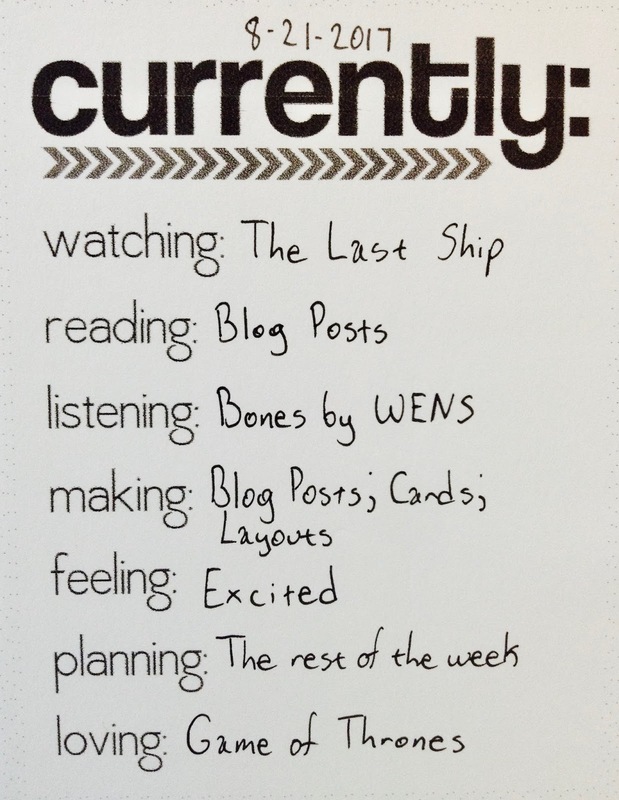 Today I'm sharing a Currently List that I made in my Moleskine sketchbook using my Currently List stamp set from Rukristin. My stamping was not the best this time, but that's ok. Watching: I will never get tired of watching Law & Order: SVU. 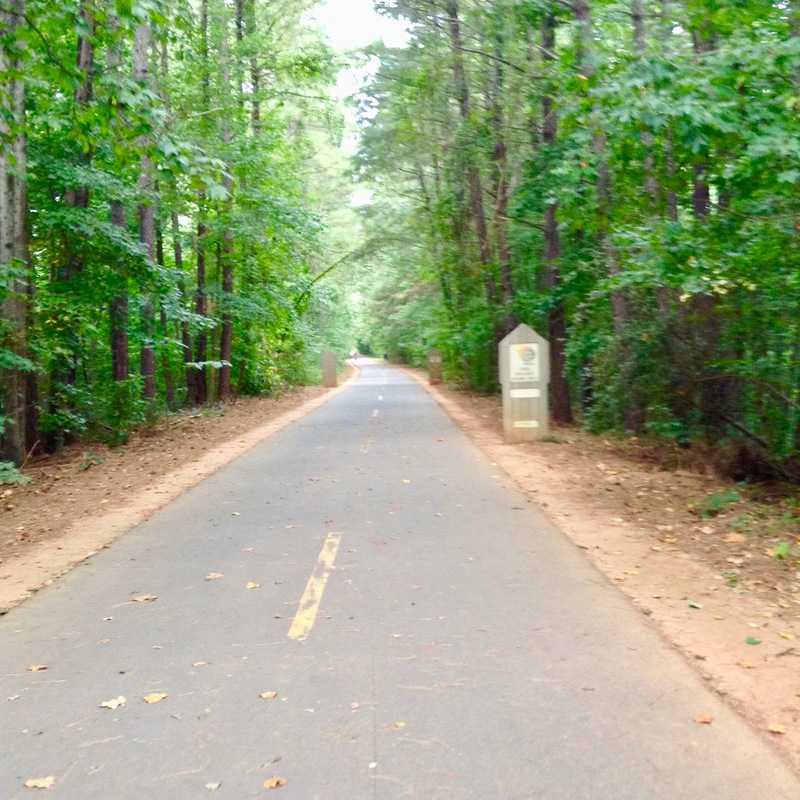 Reading: I finally caught up on some blog posts. Usually on the weekends, I don't read a lot of blogs so I try to catch up on Mondays. Listening: One of my favorite things about Hacksaw Ridge is the music. There are some really great songs in this movie. My favorite song from the soundtrack is Praying. Making: I've been making some new Fall cards and I plan to make some Halloween themed cards soon. Feeling: Even though I've been a bit stressed out, I am still feeling very optimistic. Hopefully it stays that way. Planning: I really want to start meal planning again so today I'm going to try and come up with a meal plan for the rest of the month. Any suggestions on some recipes? Loving: Sunday's episode of Game of Thrones was amazing! I don't even know where to begin! I'm so glad that Arya is back at Winterfell. That battle between Jaime Lannister's men and Daenerys Targaryen's dragon and the Dothraki was awesome. Happy Monday! Last week was such a busy week. My boys started school and I cannot believe that I have a second grader and a kindergartner. My boys are getting so big. Today I'm sharing a layout of my oldest son's first day of second grade. To make this layout, I used the Freckled Fawn's August sketch as a starting point. I added a few twists to the layout and decided to use just two photos instead of three. This layout was very simple to make. I just adhered some washi tape to the top and bottom corners of my layout. Then I adhered my photos. 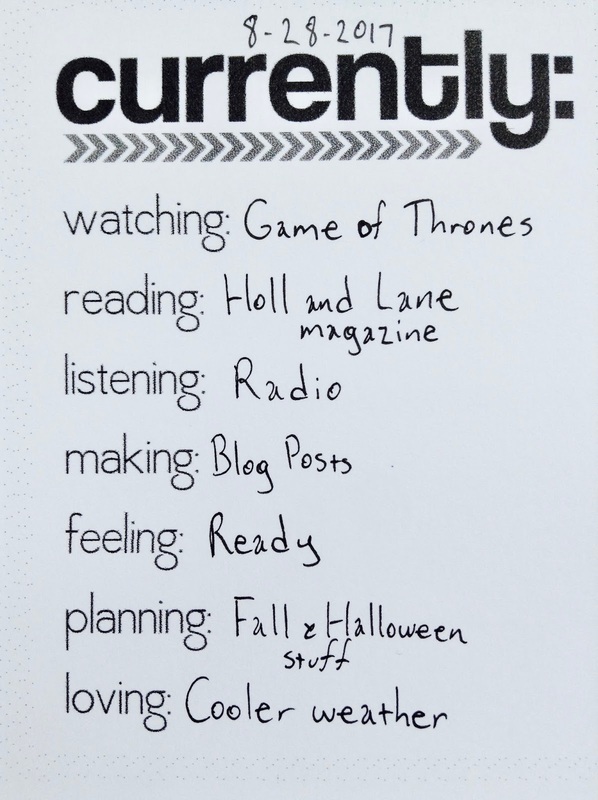 I added some journaling lines and then my journaling. Once all of that was in place, I put all of my embellishments around the photos and added some on top of my photos. I tried to use embellishments that matched the colors of my photos. I love the hint of glitter on some of the chipboard stickers. I loved making this layout and documenting my son's first day of school. Be on the lookout this week for the Project Life layout of my youngest son's first day of Kindergarten. Happy Friday! 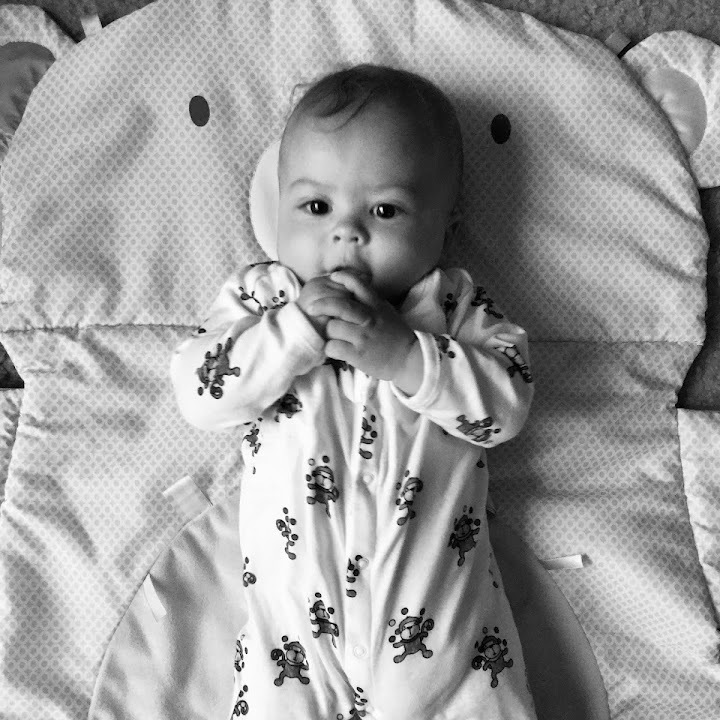 Today I'm linking up with Charlotte, Lindsay, and Beth for their weekly happy/gratitude list link up. Happy Thursday! Can you believe that it's already August? Summer is almost over and that means that Fall is almost here! I just can't wait! 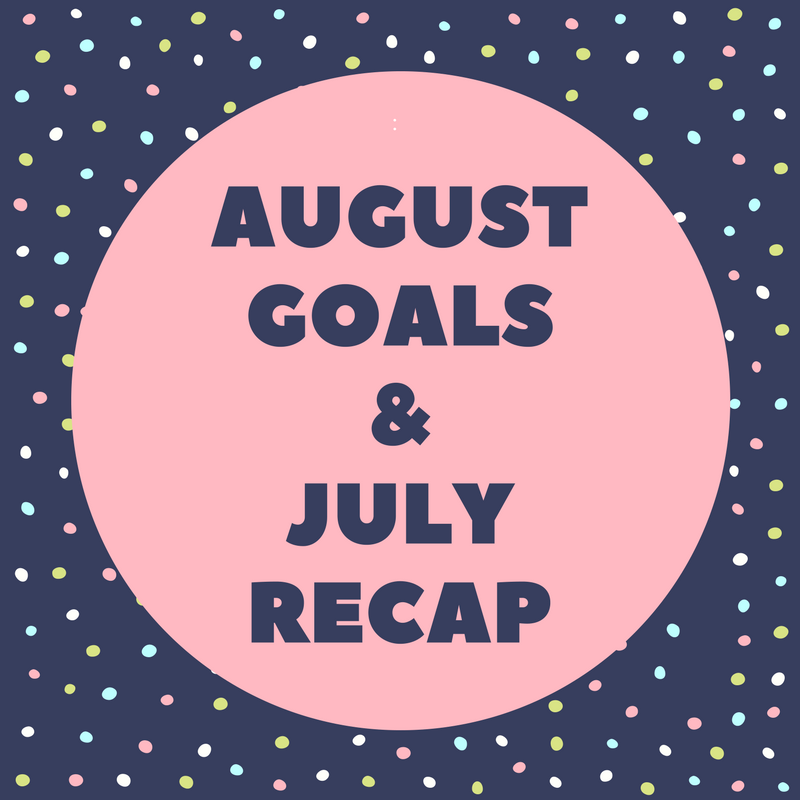 Today I'm going to share a recap of my goals for July as well as my new goals for August. Read 1 book: This was a fail. I really need to get it together and make more time to read a book. I read a lot of blogs and articles, but never seem to have enough time to read one book in a month. However, I am taking my time with the current book that I am reading because I am taking notes on it. Hopefully I can finish the book this week. Post 15 blog posts: This was a success. I only published 16 blog posts, but it's still a pass. Work on my Project Life album: This was a success. I have been working on my Project Life album. I'm currently using my Project Life album for documenting my Summer as well as for layouts for The Awesome Ladies Project. Try 2 new recipes: I'm not sure whether or not this is a pass or a fail. I did try a "new recipe". While I was making dinner, I realized that I didn't have enough ingredients for one of my usual recipes so I ended up substituting some ingredients. I guess you could call it a new recipe? Work on increasing social media and blog engagement: This was a success. My social media and blog engagement is slightly increasing. Hopefully it continues to grow in the next few months. Although school has already started for many kids, I thought I would share some tips on ways to save money during this time of year. Even though you may notice folders that are 50 cents and 25 cents glue sticks, having to purchase so many school supplies can definitely add up. 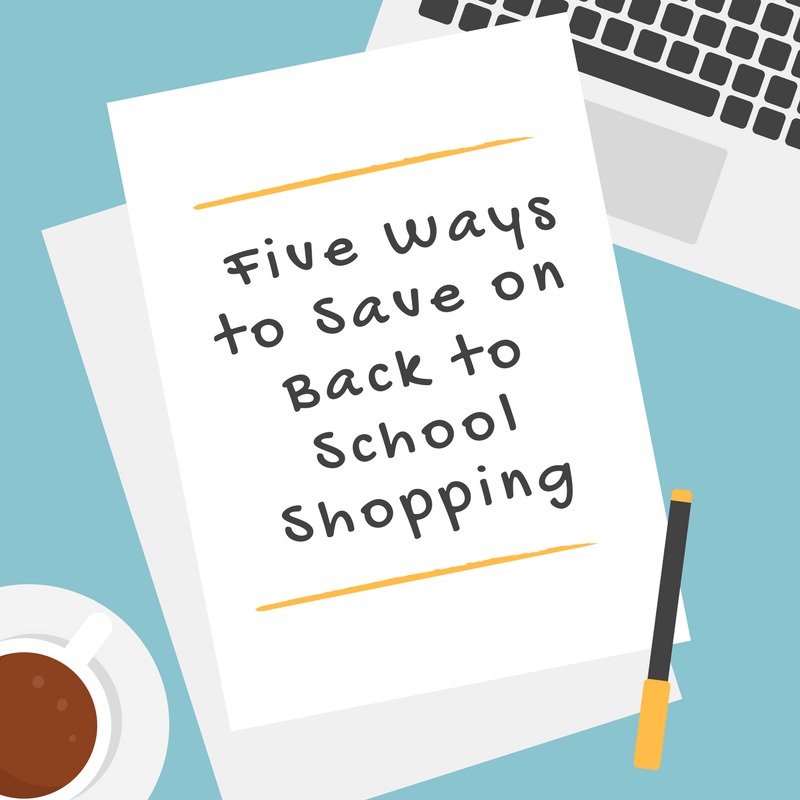 Check out the ways I save money on Back-to-School shopping below. Once I have the school supply lists, I always start to keep an eye out on the sales ads. I usually look out for ads for school supplies, clothing, and shoes. I always gather Walmart and Target sales ads for school supplies. For clothing and shoes, I check out The Children's Place, Kids Footlocker, Payless, Gymboree, and Toys R Us. Sometimes, I even check online for sales ads. There's this amazing website called Southern Savers that teaches you how to coupon, has specific store sales ads (they even have unadvertised deals for some stores), coupons, and a Sunday paper coupon insert schedule. You may want to purchase the Sunday newspaper for the coupon inserts. The past few weeks, I have found some coupons for school supplies. If you get random mailers in your mailbox, don't throw them away. I found a lot of coupon inserts in them and there were tons of coupons for back to school shopping. You don't have to get name brand school supplies. Most school supply lists have the words "Suggested Supply List" at the top so don't feel pressured to buy brand name products. 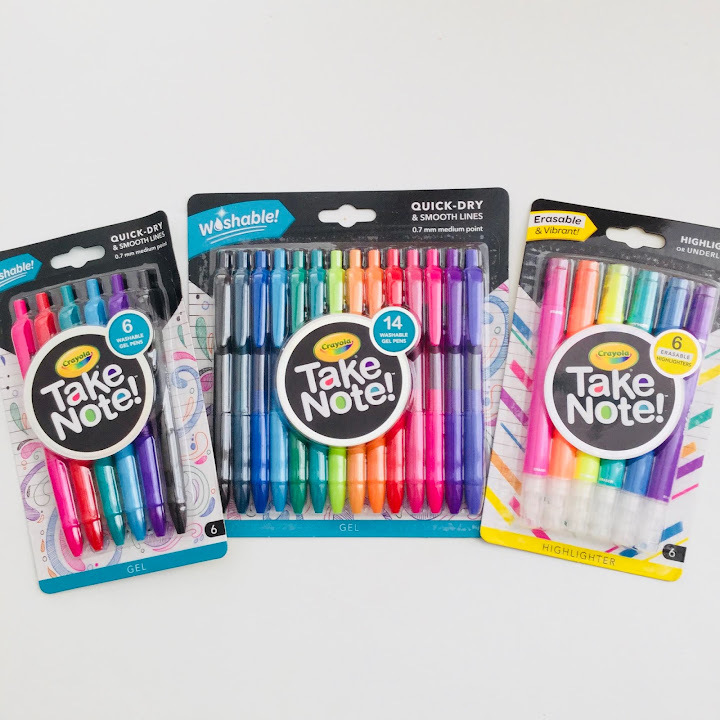 Often times, you may not find the exact brand that is listed on the school supply list so just get the generic brand. I purchased some generic "Pink Pearl" erasers at Walmart for nearly half the price of the brand name erasers. So many of the stores that I shop at have reward programs. I highly recommend that you sign up for them because many stores will email or mail exclusive coupons. Sometimes you may even be able to find out about sales before everyone else. Some of my favorite reward programs are Toys R Us, The Children's Place, and Payless. You can sign up for the Toys R Us reward program at Rewards R Us or at your local Toys R Us and Babies R Us store. You can learn more about The Children's Place rewards program here. You can also learn more about the Payless rewards program here. I also love to use Ibotta. Ibotta is such a great way to get cash back for buying items. Before you shop, you add rebates and complete tasks. Then you simply purchase the items at participating stores. You redeem your rebates by scanning your receipt. I also recommend Target's Cartwheel app. You can save so much money on everyday items, seasonal items, clothing and shoes. The cartwheel app currently has a section specifically for Back to School and Back to College. Every store that I have listed so far has an email list. I always get sales ads, coupons, and even birthday rewards from several of my favorite stores. I definitely recommend that you sign up for your favorite stores' email lists. Watching: Hacksaw Ridge is such a good movie. It's about a man named Desmond Doss who was a pacifist combat medic in World War II. Reading: I've been taking my time reading this book because I'm taking a few notes from the book. Listening: I still love this song. I just found out that Foster the People released a new album this month so I definitely have to check it out. 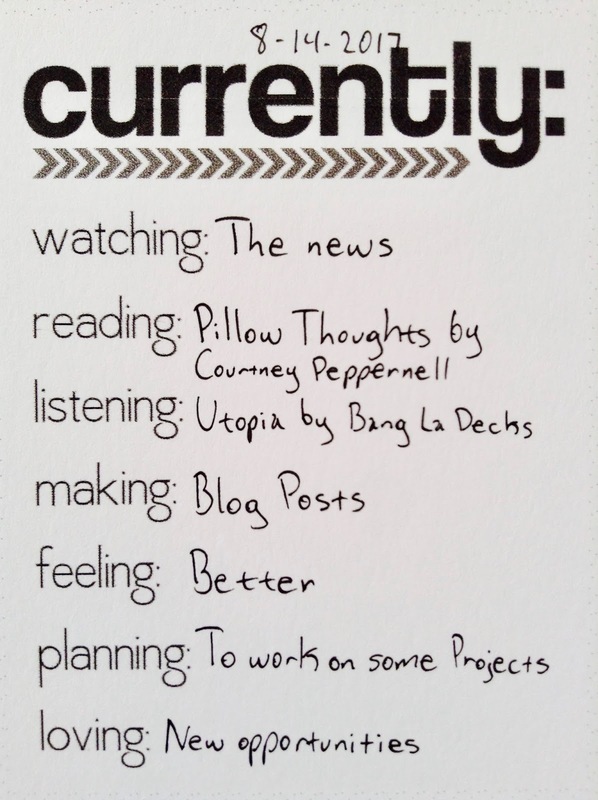 Making: I've been journaling a lot more and I love it. I think keeping a journal is so important and therapeutic. I love adding lists, quotes, random thoughts, drawings, etc. in my journal. Feeling: Today is the first day of school for my boys. I can't believe that my boys are in second grade and kindergarten. I hope they have a great first day and an amazing school year. Planning: I have to update my planner. Now that school has started, I have to start adding lots of school events in my planner. I also have to work on some blog posts and update my shop. Loving: I woke up today feeling so energized and full of positive vibes.